Oracle BPEL and Oracle Service Bus both offer many common features making it difficult to choose one for a particular integration scenario.However both have a different focus at application integration. OSB on routing and BPEL on orchestration. A detailed look at your use case needs from the current and futuristic view should give you a cue on which one to pick. For example consider the integration scenario illustrated in the figure below. The integration features mentioned in the above diagram can be achieved by Oracle Service Bus and also Oracle BPEL. So which one to chose depends on multiple factors. a. Does application B changes its end points frequently? b. Do you need a extensive transformation capabilities between xml files , binaries and texts or across each of them ? c. Are you looking for a Asynchronous two way communication between your service and applications.? d. Are you in need of automatic service load balancing ( note : just not node lode balancing given by cluster)? e. How is the integration between these systems change in the future? Is the logic going to change too dynamically or is it going to get too detailed ( complex) or does it going to expand by interacting with many more applications.? f. and Of course the licensing details. 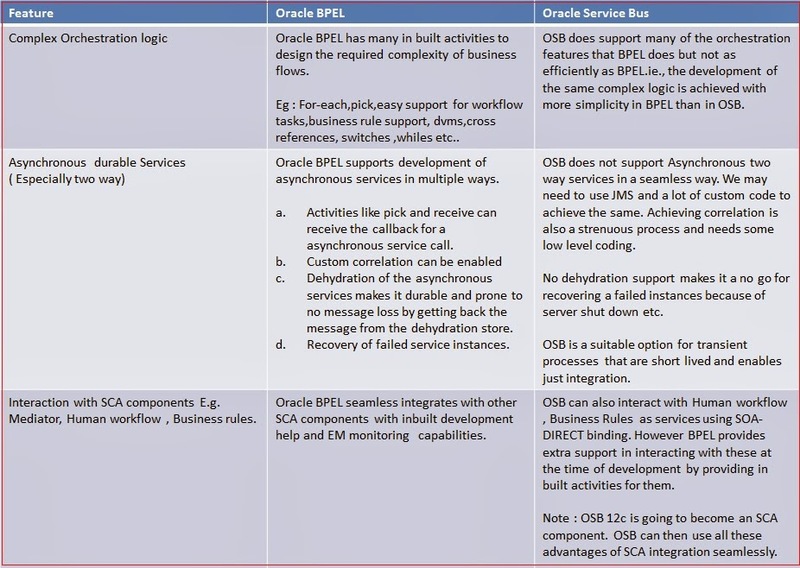 The below table illustrates the features of integration that OSB is better than BPEL. If your integration scenario has priority over the below features then you should prefer OSB. 1. Built in features to generate reports and dashboards. 2. Define SLA's and trigger alerts based on them. 4. Ability to use MFL and Xquery. 5. Developing the orchestration at the run time using console. As described above,you should tend to using BPEL when your focus in on orchestration ( ahh this same old thing every blog said but just true !!) and on more back and forth interaction with SCA components and SOAP services. a. More protocols are supported. b. OSB exposes JMS, File, FTP as direct transport versus via adapter which (probably) offers higher performance as adapters is another level of logic to access the same. 2. Support to Technology/Application/Packaged adapters. 5. Content / Header based routing. 8. Dynamic routing based on business logic. The features you want to enable in your integration may seem to be achieved by using either of the components -OSB or BPEL. However a thin line can be drawn when you have a detailed look at the additional capabilities that you want to have along with the basic features.Those features may not be a part of current requirements but may be in the future. A true architect should be able to visualize those and make sure that the right component is picked in the first go. Absolutely a great article. I could now really be able to pick between OSB and bpel for my use case. Thanks. "1. OSB is statelesss and BPEL can be made stateless by setting the audit settings. However the audit settings turning off doesn't apply to mediator. 2. You dont get any monitoring and SLA management capability with Mediator and SOA. 3. SOA Suite provides a better capability to handle transactions, compensation and asynchronicity." Nice... even for people who hardly have any exposure to either , this gives a sound picture to envisage both. Thanks for the comments. There is a similar thread on linked in to decide between the components for a huge txn volume scenario . you can fin it here. Excellent article. I think this article clears all the doubts either to select BPEL or OSB.